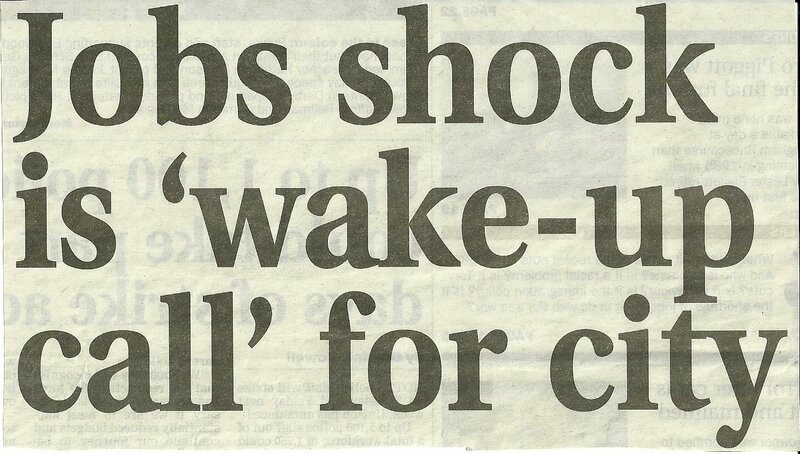 This was the headline in Wednesday's Nottingham Post. The word 'shock' was also used in the continuing article on page 9, and in the editorial column on page 14. What is it that has 'shocked' people? It is figures just produced that shows the Nottingham city council area with an unemployment rate of 14.8% for last year, when the national rate is 7.8%, and that for the East Midlands as a whole it is 7.6%. These figures have been produced by the GMB union, and are based on those produced by the Office for National Statistics (ONS). They reveal that Nottingham has the worst unemployment rate in the UK. I can't work out whether the 'shock' relates to the level of unemployment, or to the fact that we are the worst in the country. There should be no shock in the unemployment figures, as anyone who studies these things could see a trend from quite a way back. The ONS produce monthly statistics that are available on their website. In May 2011, those claiming Job Seekers Allowance was at the highest level since 1997. 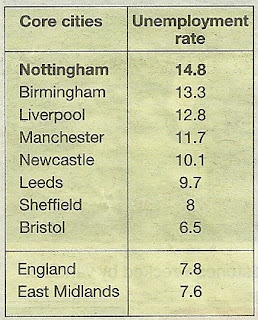 And in the City Council's own reports it admits that "since July 2010, Nottingham has consistently performed worse than the national average". They go on to say that since January 2011, "unemployment in the City has increased by nearly 9% while nationally there has been an increase of less than 1%". 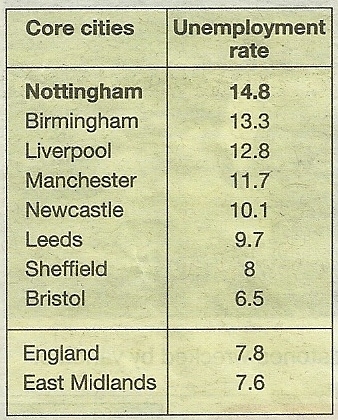 Going back to the period July 2009 - June 2010, the local authority with the lowest employment rate in Great Britain was Nottingham with a rate of 55.5%. Within the East Midland region, Nottingham is the only area to see a large increase in unemployment in the last year. It doesn't take a genius to work out that there is a problem. Some, while admitting that the figures are not good, are already trying to say that they're not as bad as they are made out to be. The deputy leader of the City Council has said that the figures may not tell the whole story. He is quoted as saying that, "Figures for Nottingham City and the three adjacent districts - Broxtowe, Gedling and Rushcliffe - give an unemployment rate of 10%, the same as Salford in 42nd position". No, I've no idea why this comparison is being made either, as it's the city figures that are being discussed. The Editor of the Nottingham Post is certainly trying to 'talk-up' Nottingham (I don't blame him there). To him the figures are 'disappointing', and goes on to say, "But today, we publish in the Post hundreds of local job opportunities and thousands more are available at job centres across the city and county". However, just a quick glance at these adverts shows the level of skill and experience that employers are looking for, which makes them unavailable for the majority of those who are unemployed. This is confirmed in the same newspaper by the Chief Executive of the Derbyshire and Nottinghamshire Chamber of Commerce when he said, "The crucial element here is skills and training. While businesses are still keen to take on more staff, many are reluctant to employ people who are not equipped with the right skills, qualifications and - crucially - attitude to work". Those last three words are very telling, 'attitude to work'. Skills can be taught, experience can be gained, but how will this 'attitude' to work be addressed? Reasons given for high levels of unemployment may well have some truth to them, such as high public sector presence in the region, and subsequent job losses; the large number of students may also have an impact. But these are also true of other areas that are not suffering in the same way. The bottom line is that Nottingham has lost too many jobs, and not created enough to replace them. Some are pinning their hopes for the future on the Government's Work Programme, which is a short term scheme to replace the Future Jobs Fund. However, it does not guarantee a job at the end of it. Others are excited by the new Apprenticeship Scheme. Now, I'm an ardent supporter of apprenticeships, as I had one myself in the 1960's, but I was guaranteed a job at the end of it. As I understand it, the new scheme will provide 250,000 apprenticeship places over five years. This is 50,000 per year for the whole of the country, with no guarantee of a job at the end of it, for employers will be looking very carefully at the situation once the apprenticeship subsidy has been removed. Now, I support these schemes, even if they are flawed; some work is better than none at all, but they are trying to address decline with short-term measures. I have yet to see a ten-year strategy to bring meaningful and acceptably paid jobs into the city. If I've missed it, no doubt someone will tell me where I can get hold of it. But, are we really trying to fight the inevitable here? Are we modern day Canute's trying to hold back the sea? We are no longer a big manufacturing nation, and the demise of high staffing industries such as coal, steel and shipbuilding, has robbed us of opportunities to employ thousands. Full employment is a dream never to be realised - that is the harsh reality. Why would I say such a thing? Now let me make it clear, I am no communist, but I do believe in a brand of socialism that is no longer a political choice in this country. I am no follower of Karl Marx, but I do find that some of his theories on unemployment are close to the mark, and resonate with me. His 'Communist Manifesto' (1848) and his 'Theory of Surplus Value' (1863) have words that are worth considering. Even 150 years ago, to Marx the battle was between Capitalism and Socialism. Capitalism is described as an economic system in which the means of production are privately owned and operate for profit, usually in competitive markets. In Marx's 'Theory of Surplus Value' he says, "It is in the very nature of the capitalist mode of production to overwork some workers while keeping the rest as a 'reserve army' of unemployed paupers". According to Marx, unemployment is inherent within the unstable capitalist system, and periodic crises of mass unemployment are to be expected. "The function of the proletariat (working class) within the capitalist system is to provide a 'reserve army of labour' that creates downward pressure on wages". To Marx, this is accomplished by dividing the proletariat (working class) into surplus labour (employees) and under-employment (unemployed). This 'reserve army of labour' fight among themselves for scarce jobs at lower and lower wages. Things have changed of course since the mid 1800's, as we now have a minimum wage, but I have always argued that this is not a living wage, and the battle still rages with people as to who will work for the minimum. Marx held the view that unemployment is profitable within the global capitalist system because it lowers wages which are costs from the perspective of the owners. But it does not benefit workers, as the system unfairly manipulates the market for labour, by perpetuating unemployment which lowers labourers demands for fair wages. 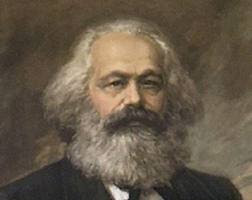 In the 'Communist Manifesto', according to Marx, the only way to permanently eliminate unemployment would be to abolish capitalism and the system of forced competition for wages, and then shift to a socialist (or communist) economic system. Modern Marxists see the existence of persistent unemployment as proof of the inability of capitalism to ensure full employment. While any real job creation scheme is to be welcomed, most of those in existence (Work Programme, Apprenticeships) are Government sponsored, and as I've said previously are short-term solutions. Capitalism may be the preferred choice of the electorate, but this political choice of "the means of production" being in the hands of private ownership and operated for personal profit does bring some social consequences, and one of those consequences is unemployment.